The Democratic women wore all white as a sign of solidarity. They remained seated and tight-lipped when the President entered the House Chamber to sustained applause from male Republicans and Democrats. The stone-faced women glared at Trump as he began his speech. But the tide turned when the President mentioned the rising employment numbers for women. "No one has benefitted more from our thriving economy than women, who have filled 58% of the new jobs created in the last year," Trump said, as the Democratic women rose to their feet and cheered. 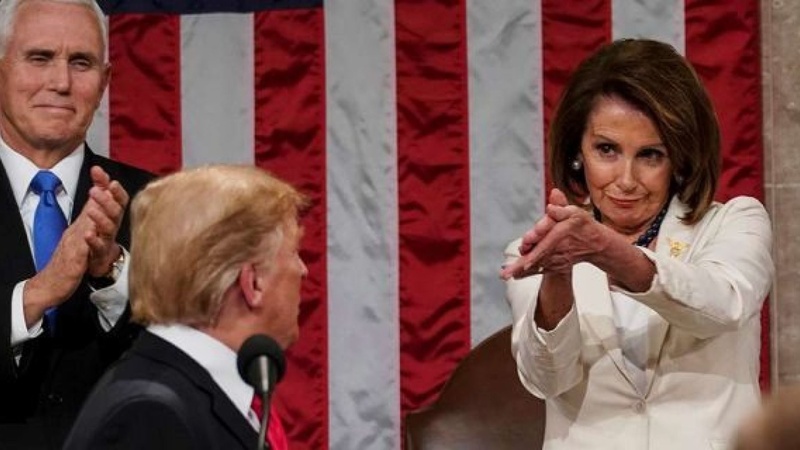 House Speaker Nancy Pelosi, who sat behind Trump, also stood and applauded. "You weren't supposed to do that," Trump joked with the women. He urged the Democrats not to sit down yet until they heard what he said next. The Democrat women applauded enthusiastically and high-fived each other when Trump mentioned there are more women serving in Congress than ever before in history. The Democratic women displayed a level of admiration and joy for the President that shocked anti-Trump leftwing journalists on CNN and MSNBC. But women's rights groups took issue with President Trump when he said one in 3 migrant women are sexually assaulted during their treacherous journey from Central America and Mexico to the U.S. southern border. "A man who brags about grabbing women's genitalia and appoints Cabinet members to strip Title IX protections from survivors does not get to weaponize women's trauma to promote a racist border agenda," a spokeswoman for the TIME'S UP Legal Defense Fund tweeted. You gonna send us back to silence. Sandra do Maxine Waters know you watched the SOTU? It’s not what I wanted but I’m glad Ms Sandra you okay! ?? COME ON SANDRA WE ALL KNOW THEY WERE BEING SARCASTIC AND CHEERING FOR THEMSELVES WHEN THEY STOOD AFTER HE SAID MORE WOMEN WERE IN THE CONGRESS THAN EVER B/C HIS BS IS WHY THEY RAN AND PEOPLE ELECTED THEM........JENNY JONES!!! Maybe when it's 60% women & 40% male, we can get something done. ahhhhh!!!!!! you hit 'em with the Sam L. crazy eyes!!!!!!! yasssss!!!!! I live!!!!! Sam is one crazy %^#$(&^ ! Latanya can have him. NOT. They were clapping for themselves not the Orangeman. What is the obsession with that cortez woman she aint done nothing. I saw one interview 2 c what all the fuss was about n l said really. That the look a man gives u when u got a twang in that thang. Please all workplaces have that one man that acts as if he is on his period everyday. DWL!! High AF!!! I saw the news clip this morning and they were cheering for themselves!! Not sure how that is being interpreted as a standing ovation for Agent Orange but mmkkkay!! Oh please! Men will give up the nuclear codes to fawk the right box. Men let their d!cks rule them and become idiots. Risk it all-family, job and respect over a moist hole. That’s why honey traps work so well. Was just gonna request a Bob Marley post! Drip Drip ... Maxi Pad!! Doesn't even have to be moist. They r@pe the d3ad. They were applauding that more women then ever before have seats in Congress & that more women are on the work force. These numbers have NOTHING to do with him but I guess that doesn't stop him from claiming that victory. Risk it all-family, job and respect over a moist hole. And sometimes ANY hole will do. Cat, dog, lil boys, men, babies. They don't discriminate nowadays. Booked on Expedia + set up a alert for when flight/hotel hit a certain price for a few properties. But yeah, if you go to cetain areas there will be a monkey or two on the villa roof/ patio sometimes. They keep to themselves though and it's beautiful there, food and drinks pretty good and affordable too. Please don't . Let him stay resting in peace. LAWD...I waited all morning for this clown...I can't ....he will take credit for a baby passing gas after inhaling air in her bottle. This man has done nothing positive for women...if he wants to do something positive put a budget in place for sexual assualted women...something he should be aware of. Yes they're indeed the party of the KKK. Gummy mouth Pelosi controls those fools with an iron fist. They were scared to clap without her approval.I wonder how they will reel in the socialist renegades in that party.Will the get the Killary treatment or perhaps the DNC Seth Rich treatment? They were not rooting for him. They were happy for themselves seeing they made history being women and mostly POC as a majority. Don't let Sandra play with your mind. Well Marley was an Aquarius and they will try anything once well twice to make sure they didn't like it the first time. Because they know that capitalism is on its last legs and people are finding socialism more attractive. https://uploads.disquscdn.com/images/a2199858fb43c618e06dc4250a6e208ac9ed441bb0a16e948c3588aad89054c0.jpg THEY.WERE.NOT.CLAPPING.FOR.HIM! But Pelosi did CLAPBACK! U forget his dad was white 2 make it a race issue. After that beautiful SOTU speech I am focused on empowerment. The left are a bunch of pets. Do they just look for dog whistles to trigger them and appease their miserable state of mind. Meanwhile at the ranch...Trump is living rent free in side their heads. If that aint power then I don't know what is. 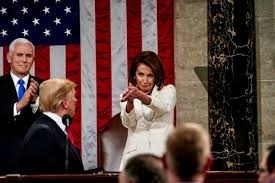 Note to democraps Complaining don't make you look powerful it only makes you look and appear bitter and psychotic.Nancy look like she sippin something other than water. Van was caught on tape saying the Russia investigation was a nothing burger. Paid for and bought pundit.I believe nothing that comes out of this walking contradictions mouth. She still hasnt done anything u see how long she lasted trying 2 go after Nancy. Capitalism aint neva going nowhere bcas folks gonna b making money off this fake socialism progressive movement. Just like dump was saying last night folks didnt want the wall but they live in a gated community. If he wasnt president u couldnt just all willy nilly go 2 dump tower get on the elevator go 2 his floor n knock on his door n say l just dropped in 2 c u. But folks who dont know any better think he is telling the truth. I know better that all of these new labels aint nuthing but a bunch of bs. It's not complaining. It's call to action to motivate people to get to the polls and vote him out. It worked during the midterms. Being powerful goes way beyond a look. Looking powerful means nothing, especially if the people who are looking at you don't vote or know how their own government operates. They were applauding themselves, not him. At least that's what happened on my flat screen. Unless you think they were giving him a standing ovation for being such a horrible President, he's basically the reason so many of these women are now sitting in Congress and gainfully employed by the U.S. government. No honey you dont get the full picture PRESIDENT TRUMP got a reaction out of them and his point is I have put you on notice to the entire country ...lets see if you ladies got the goods! They gave themselves a standing ovation. ? Because she came out of nowhere and unseated an extremely well liked, career incumbent in an upset victory. Everyone thought her predecessor was a sure win and had basically written her off. Her ideas were very progressive and she was extremely inexperienced. It's akin to the same shock that a lot of people had when Trump beat Hillary. she is a little girl with a big mouth and nothing smart comes out of it! Two sides of the same coin. I would imagine a person would be insane to believe that either party holds the interest of black folks. We should withdraw from either party because all either one is a group of white people who ensures policies to keep them in decision making positions. They are not sharing power. We all we got! The obsession is about her age, ethnicity and the fact that she came out of nowhere to unseat an "establishment Democrat." She's parlayed the attention into talking about issues that progressive care about, like universal healthcare, climate/environmental policy, etc. She's been very active in the media. So it's not really about HER, and more about the issues she's putting out there. She's just one of 500-some congress representatives, and none of these progressive policies are going anywhere until Trump is out of office (and hopefully a Democratic majority in the Senate). This country has always been a mixture of capitalism and socialism. That's not changing. But, what will change is the tax burden on the rich. They will eventually be forced into paying more. These extreme socialistic views are just conversation starters. We'll eventually land in the middle somewhere. Venezuela was (is) also extremely corrupt and functioned much more like a dictatorship than a democracy. I'm not saying you don't have any point at all, but there's other factors than socialism at play. We're far closer to the capitalism side than socialism right now, imo. You are so Doggone RIGHT!!!! and that is why in foreign countries where women are Prime Ministers, Heads of State, etc. They ALWAYS have a male cabinet thats right and they give them the Protection and Balanace that you CANNOT get from hormonal, premenopause, post menopause, women! Still laughing at him saying we need 2 stop ridiculous partison investigations. Does Clinton emails ring a bell. Helloooooo. If l hear that one mo time lmma scream. It just keeps on going going going n going. They reacted to what he said. They stood and applauded him. Then they turned and high-fived each other. Yep n u see how we r paying for now. We have an inexperienced president who cant even read. She couldnt even explain who was gonna pay for medicare for all. nancy go somewhere and sit yo behind DOWN!!! It's a two party system and blacks only make up 13% of the population. So exactly what would withdrawing do? Because one of the two would still be elected. But the fact is, your LOCAL government have more control over your everyday life than the Federal government. So blacks need to start getting involved in their own community elections. That's where your voice matters most and that's where it's enough of us to actually have an impact. I dont have to disparage you because your liberal dog whistle will do it for you. 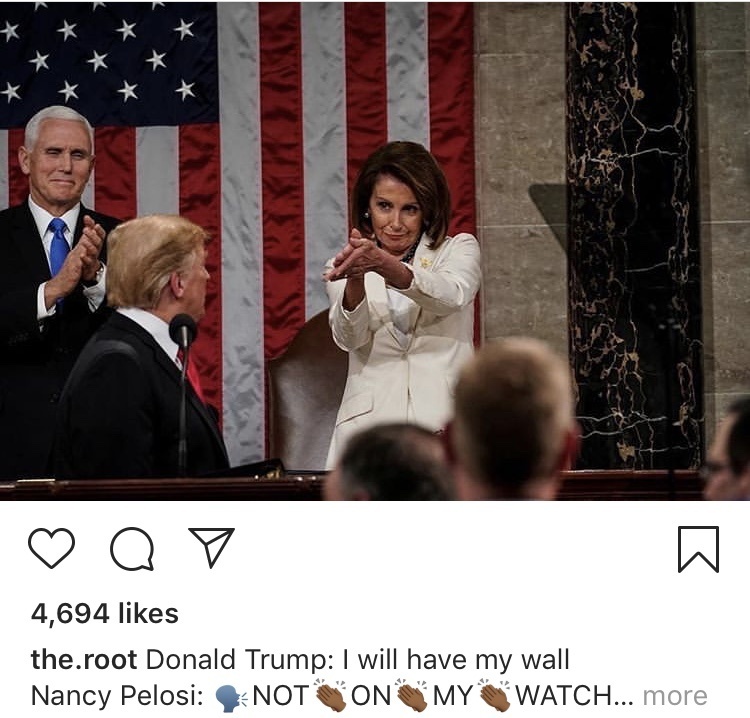 There was NO winning over of anyone to Trump's points of view during that SOTU address. He is fully pandering to extreme right base with more divisiveness and attempting to cajole the on the fence folks of the right with the I am going to stop AIDS and conduct prison reform. Trump desperately wants to have at least one bipartisan victory to parade and crow about during his re-election campaign. I want to see the tax returns. Period. I want to know exactly how deep Trump is in with the Saudis and the Russians. The difference is that she's in local government. Her constitutes have greater access to her and can hold her more accountable. I really need the landowners down there to release a statement as well. They need to tell people that they are NOT about this wall. At. ALL. From the looks of it you have been supporting more wasting money in Congress than actual legislation. I guess we will wait until the illegals get here so they can better trained pets to pacify. Proving my point to a tee. Thanks Mielle. Its been a pleasure. BTW, I have stated on here time and time again that I am an independent. Facts are fun that way, but, continue on with the same old same old font. They were giving a standing ovation for themselves, for women achievement. Not for Dump. Not really. Entities like the USPS, the US Army, Social Security, Public Schools, Corporate Subsidies, Federal Student Aid, Garbage collection and a whole LOT more are all socialist programs. The problem with capitalism in the US comes down to tax rates and the redistribution of wealth. 38% of all US wealth is held by 1% of the population. That has to change. And entities like FOX News and Donald Trump, who are both filthy rich, will have you believing that changing it means socialism, when that's simply not the truth. Yeah even megan mcpain gonna say she is better than nancy bcas she got more twitter followers. So elect people by Twitter followers not by knowledge. That is why we r in this mess. Sooooo 1% is bad but 99% is good got it.. kinda like how the 1% is evil but the 99% is righetous per liberal thinking,but honestly that one man is probably your token m2f trans that would say that he more female then you.. I visit frequently. People go back and forth across the bridges all day long. It is a safer city. Much safer than LA where I live. We don't need the wall. It will not be the answer we need to unchecked immigration. Just a little attention and...they all melted. I went there n loved it. Went 2 the mudbaths n covered myself in mud from the volcano. My skin was smooth when it came off. The greenary was fab. Get your suntan lotion b4 o go or gonna pay 40 bucks. The party boat ride was even better. Only drawback l had was the dayum hotel didnt convert 2 english. Thank u like corruption .One model will not solve the problems of this country. LOL. Capitalism collapsed in 2008 and it's been propped up since but the wheels will slowly begin coming off again next year with the EU unravelling financially followed by the U.S. in 2022. It's going to get ugly and a lot of people are going to suffer before it gets better. He lost some of his base by mentioning AIDS. It's something extremely annoying about Alexandria Ocasio-Cortez. I'm not moved. I think he has a goiter. See it in every pic. Can we get a medical minute on a condition that can make somebody look like a bullfrog?
? Thought it was just me. This whole right up though ? If I were Alice Johnson after sitting next to that entity Jared Kushner. I would go home and say a hundred prayers, that man is creepy. He reminds of that creepy thin guy from the movie "Phantasm" that would walk around saying " Boooooooooy"????? And I get the heebie jeebies, legit shivers when I look at Pence. Pence looks quiet deranged. This country needs healing and harmony. I am choosing to be hopeful we are headed in that direction. Give credit where credit is due... His daughter Ivanka Trump has been advocating her Women Who Work campaign and women’s empowering campaign for years. I am certain she has influenced her father here. She deserves credit for her work. Socialism is the driving aspect, everything else is a byproduct of it all. Socialism does not work. Can you imagine letting everyone into this country under a socialist government? America would become a 3rd world country why because we can't afford it! Everyone is not going to pull their own weight! She’s a communist, they tend to be lofty and dreamy but well intentioned. I didn't know you could win a SOTU Address? ??? I'll be SO glad when we vote his dumbazz out. Wow 2 whole women, yes he will win the next election for sure! Trump University, Trump Foundation and Trump Inaugural Committee. What are the many things these have in common? TRUMP AND CORRUPTION! Fact: Narcissist (Once again) always, always try to take credit (.). you have GOT to be kidding, Sandra. At this point, you're just trolling YOURSELF. Sandra Mae Rose trolled the hell out of y'all with this story. They were not giving Dump a standing ovation. They were applauding and giving an ovation for female lawmakers (suffragists) for being here in 2019 and pushing through the mire of old red neck repugnant republicans. I am a proud Latina and she represents a demographic change in this country. No one will vote him out, the voting booths will be rigged again, besides the idiots voting for him. The Democratic women were celebrating their own victories and accomplishments...not Trump or his SOTU address. More propaganda and misinformation disseminated by Sandra Rose. Thankfully, a lot of commenters have already called you out on your "creative" reporting. It will be ugly either way bcas their is no one side fits all for everybody in this country. Folks been talking bout my way is better since the beginning of time n will do it until the end of time. N if yall r having cortez as a symbol of socialism we r already doomed bcas knows nothing n hasnt done nothing but has a claim 2 fame for Twitter followers n not policies. What they r doing is let the old skool democrats do all the grunt work then they cut n paste a few lines n say they have done something n add another label 2 it 2 make it sound brand new. Yet this is the person Nancy supposed 2 b skurred of. That sink sunk faster than it left the dock when nancy showed them what she was really made of. 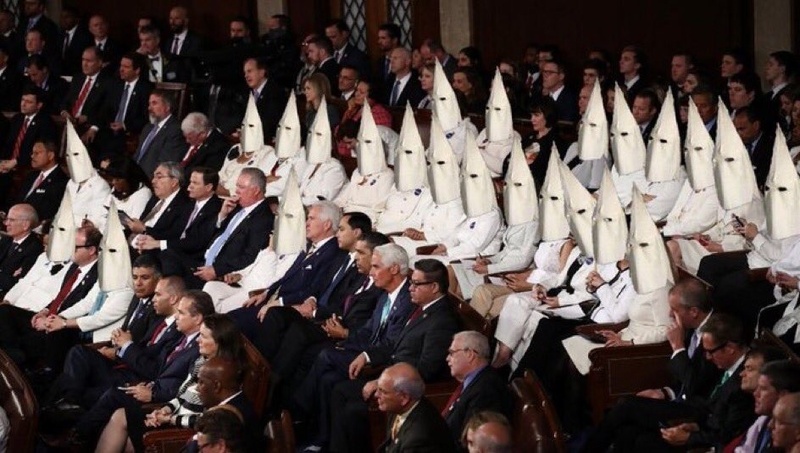 dems wearing white, just like KKK relative did, then and now. Stop it with the lies. The women were applauding because all of those women WON those seats in their individual districts, which really means that they beat REPUBLICANS to get in. Of course this went over Trumps head as he stood there saying "thank you" to them as they applauded, as if it was about him. He's so clueless and dumb. At the face of grave evil, the infanticide of children they remain silent but when it came to celebrating their honor they stand in celebration. The god of self which these women worship is a lover of self (Self absorb) it can't tell right from wrong...good from evil it's so warp in its own self delusion. I am no longer shock by what these people believe. As they say all road to hell is pave with good intentions. Dems can no longer misquander itself as a party of good because the wheat from the chaff was sifted when Trump made his statement about socialism - the aura of discomfort was palpable. If you still not yet ready to evolve from that ideology into truth after this then be prepared to deal with the choice you made, which by the way is death. You have all in that case cosign the release of Barnabas the thief and sacrifice of Christ. As far as Colin goes I see you guys blindly following the blind. Please know that you can't protest your employer for the action of another organization this is not the Noble but indiscriminate revenge. They reacted to what he said but were applauding THEIR accomplishments. He didn't win over nah Democrat up in there. You are a Republican troll ! F Off ! Sandra you have horrible perception of WTF is going on in politics if you think for one minute that these newly elected Democratic were applauding Trump. They were applauding the fact that they were newly elected after being driven to run for office in the day and age where its acceptable for the President to grab women by the crotch ! Why is Sandra, lying? Democratic Women, were giving themselves, a standing ovations. neither,,, i can lead my self, and not a sheep who actually think voting makes a difference. fugg outta here!